I commute for a couple of hours a day and have a desk job so I quickly developed a very sedentary lifestyle – I stopped going to the gym or doing the runs I’d be used to doing a couple of times a week in sunny Cambridgeshire and ate pretty badly. "I hated what I saw in the mirror. It had an effect on my mental health. In fact it was a trigger to comfort eat." After a long time living in England, I moved back to Scotland in January 2015. I work in Glasgow, so that means I commute for a couple of hours a day and have a desk job so I quickly developed a very sedentary lifestyle – I stopped going to the gym or doing the runs I’d be used to doing a couple of times a week in sunny Cambridgeshire and ate pretty badly. 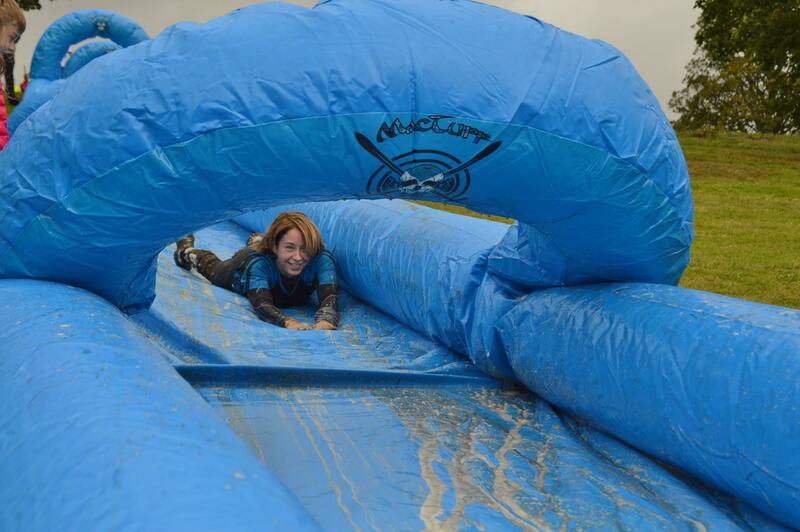 I participate in obstacle course races and my fitness was now at its lowest for years. Not that I was ever spectacularly fit by any means, but I could run 5k without too much complaint, haul myself over walls, up ropes and do my burpees without too many moans. But not any more….and I hated what I saw in the mirror. It had an effect on my mental health. In fact it was a trigger to comfort eat…. I was in one big vicious circle!! Over the next few years, I joined various gyms and/or paid for private PT, but always failed to motivate myself to get into a good routine and stick to it. Then I stood on some scales in spring 2018 and had a complete wake up call. My weight was almost the weight it was when I had my son (who is almost 17 now, so the excuse I’d had a baby didn’t really wash anymore!). I could feel the middle age spread slowly becoming a spare tyre around my middle. I came across Burn It Fitness on Facebook, pinged a message to ask to come along and try a class, then twice cancelled that first class (for valid reasons, honest!) but I finally got along in May 2018. I didn’t know a soul there. I was made welcome by everyone and there was no shouting to do more, go faster, work harder etc. There was encouragement to work as hard as I could but definitely no shaming or shouting. I loved it. Over the next few weeks I got into routine of going along to classes twice a week. I thought a bit more about what I was eating and noticed that I dropped some weight. After a few weeks, the option to join the body transformation programme starting in August came along and although I’d lost weight, I signed up because I wanted to be more educated on how to lose weight and get fitter sensibly with a view to keeping the weight I’d already lost off. My goal in terms of fitness when I signed up to the transformation was to be able to run a 10k “comfortably”. In my head I wanted to get it done in under an hour. I wanted to use the programme as a way to make myself attend at least 2-3 classes per week. I didn’t focus on weight loss because I knew I’d lost a bit already so anything else from that viewpoint was a bonus for me. I smashed my 10k on the Forth Road Bridge on the last Sunday of the transformation. Mind you, the bridge is pretty flat and I was a bit stop-start, but I managed to get the job done in 50 minutes. Goal achieved! In the end, over the ten weeks I had managed to reduce my body fat from 27% to 22%, lost 10lbs and dropped two dress sizes. No wonder I could run a bit quicker! The support from both Paul (& the other instructors) and the others participating in the transformation was fantastic. Now I feel fitter and better than I have in such a long time. I feel a part of something quite fab. If you are thinking it’s time to make a change then come along and try a class out. Since deciding to do “something” and stop being lazy, I went along to my first Burn It session in June. I lost a bit of weight over the next few months on my own but needed help so I started the 10 week transformation programme in August. I’ve lost a stone and a half since June, my BMI is great for my age, my body fat is down 7% and I feel better than I have in years. If you are in West Lothian and are looking for a supportive group to kick start your health/fitness again, then I recommend having a look at Burn It. All people, all shapes, all sizes, all fitness levels accommodated. No shame about what you can’t do. Lots of focus, support and encouragement for what you can do…..You might just find yourself in the best shape of your life and doing burpees for fun!